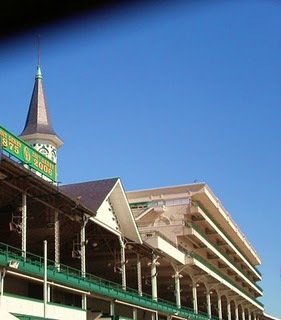 I hope the sun is shining bright on my Old Kentucky Home today – it’s Derby Day! Best time of the year to be in Lou-a-vull. Two weeks of non-stop partying and festivals in celebration of the fastest two minutes in sports. In honor of the Run for the Roses and my Southern heritage, I’m posting my column from the Bozeman Daily Chronicle on April 25. Strange things happened on my roundabout journey to Montana – I lost a lot of stuff. Not the things that went missing between Indiana and Wyoming. Not the possessions that I left on the side of the road in New York because they wouldn’t fit in my Montana-bound U-Haul. What I lost is something that I miss most – my y’all. I hail from the land of fried chicken, grits and sweet tea. I was born and raised in the Bluegrass State where the thoroughbreds will Run for the Roses next Saturday in the Kentucky Derby. While there’s no way to convey my Southern accent in writing, if you ever overhear me ordering pie, it’s a dead giveaway. If I get talking fast enough, my accent becomes so thick it threatens to strangle every word. Try as I might, I’ve never been able to shake my twang. But after moving around the country so often, I took great pains to remove all Southernisms from my vernacular. I’ve told people I’m from Louie-ville, not Lou-uh-vull as the good Lord intended it be pronounced. But I quickly learned if I said it correctly, people would look at me with their head cocked to one side like the Victrola dog. Not surprisingly, some people equate a Southern accent with being a dim bulb. I’m guessing these are the same folks who have witnessed a mullet-headed male, usually clad in a tank top, utter -“Watch this, y’all” – signaling their imminent Jackass inspired demise. But we really do sit a spell and chew the fat. We say Ma’am. On Sunday afternoon we go over to Mom and Thems (pronounced correctly as one word and rhymes with homonyms). We fry everything from okra to Twinkies. We always have enough fixins on hand to whip up a casserole or Jell-o mold in case of a bereavement emergency. A Southern woman’s daily conversation is sprinkled with colorful phrases particularly when sniping about other women. Hushed whispers occur when a woman has let herself go to pot. This is especially true when said woman has developed a front fanny at which point you can’t tell whether she’s comin’ or goin’. (We also drop the ‘g’ at the end of all words). Under no circumstances should a woman ever look like she’s been rode hard and put up wet or throw a hissy fit in public. The worst offense is for an uppity gal to get above her raisin’. And as all Southern women know, uttering “bless her heart” after any derogatory comment negates the meanness – well, most of it anyway. But now I aim to give my Southern dialect its due. I vow to embrace the verbal eccentricities of my heritage ‘cause that would just butter my biscuit. I reckon y’all won’t mind. And I’d sure be much obliged. Denise Malloy misses hush puppies almost as much as her y’all. « I’m in Funny Times!